Now showing at Chaos Theory 13 at Legend City Studios: At right, my new painting Psychoactive Snack. Photo by Jamie Peachey, courtesy of Phoenix New Times. See the full slideshow at phoenixnewtimes.com. Through November 19, I’ll be showing in Chaos Theory 13, an invitational art extravaganza organized by downtown Phoenix artist Randy Slack. 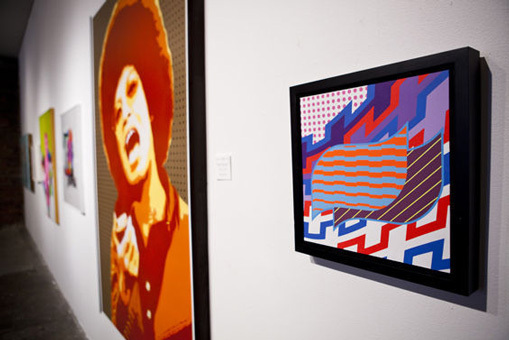 Held annually at Legend City Studios, Chaos Theory brings together 60 artists from Greater Phoenix. Each artist offers one work to exhibit. Randomness is the guiding parameter, yielding a remarkable order: While Slack might experience chaos during the installation process, he always finds a way for the work to fit together. This is my fourth year participating in Chaos Theory. I am exhibiting Psychoactive Snack, a new abstract geometric composition that manifests my rootedness in neo pop art. Sixty artists are included in this year’s edition of Chaos Theory, which opened Friday, October 6 in conjunction with the downtown Phoenix First Friday art walk. A second viewing opportunity will be offered Thursday, October 18 — on the Third Thursday art walk, from 6 to 11 p.m.
Additional viewing opportunities are available during regular business hours and during the Downtown Phoenix Chamber Series, held at Legend City Studios the weekend of November 17 – 18. Legend City Studios is located at 521 W. Van Buren Street in Phoenix. View a Google map.